Saturday, March 3 2018, 8:00 pm. 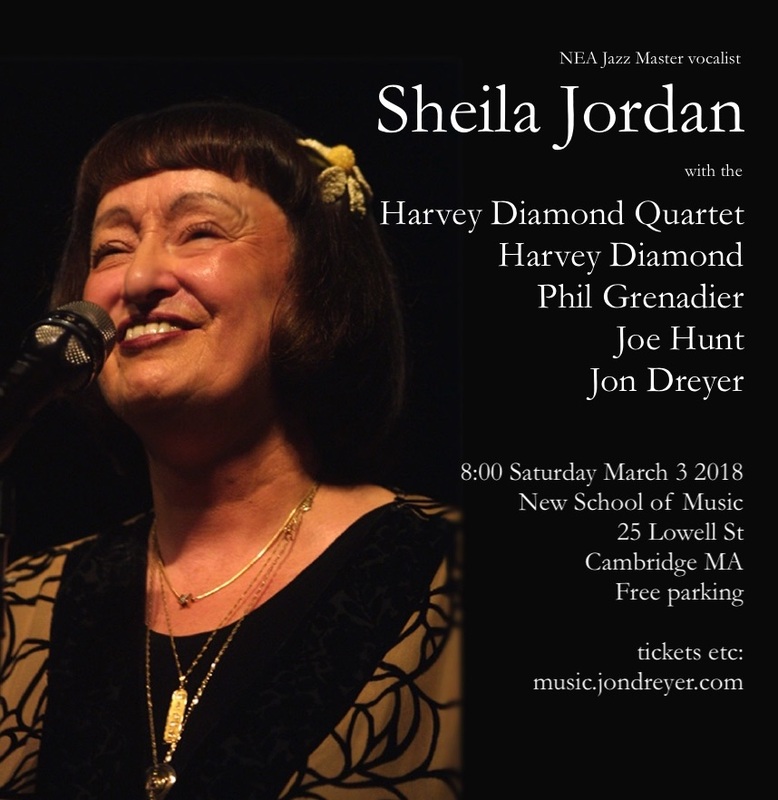 Jazz concert featuring NEA Jazz Master Sheila Jordan with the Harvey Diamond Quartet. Harvey Diamond, piano; Phil Grenadier, trumpet; Jon Dreyer, bass; Joe Hunt, drums. At the New School of Music, 25 Lowell St, Cambridge MA. Walk from Harvard Square, take the #71 or #73 bus, or park free in the lot behind the school. Overflow parking on street or around the corner in the pay lot at Mount Auburn Hospital. The legendary jazz pianist Harvey Diamond has graced the Boston area for decades with his music which is at once both deeply intricate and deeply emotional to even the most casual listener. Over the years he has performed across the U.S. and in Europe. among Lennie Tristano's last students in the 1970's, and has done concert appearances with NEA Jazz Masters Sheila Jordan, Dave Liebman, and Art Farmer, and also with Charles Neville, Herb Pomeroy, Harvie S, Jay Clayton, Joe Hunt, Don Alias, Jason Palmer, Cameron Brown, Marc Johnson, Marcus McLaurine, and many others. After decades of patience by his fans, he has finally released his first CD as a leader, The Harvey Diamond Trio . Sheila Jordan says, Harvey Diamond is a fantastic pianist. He plays from his heart and totally disappears into the song. He's a real joy to sing with. Bassist Jon Dreyer is one of Harvey Diamond's closest collaborators. He also performs regularly with James Merenda, both as a member of his band TickleJuice and also in more mainstream jazz settings, and has performed with most of the Boston jazz community, including Jason Palmer, Adam Janjigian, Yoko Miwa, Frank Wilkins, Dominique Eade, Phil Grenadier, Joe Hunt and Steve Langone.